The necessity of using third-party cleaning applications is one of the most controversial topics among Mac users. One can come across two opposing opinions claiming Mac cleaners as useful as harmful at the same time. The controversy stems from the fear of the potential security threats posed by any alien Mac apps. Warnings about the possible viruses infiltrating via the third-party apps are not a rare sighting on the Apple Community. Not every app is Mac’s security hazard. Still, finding the cleaning software to rely on takes some time. The best way to choose the trustworthy item is to read an honest user review. Customer testimonials are extremely helpful when you need to pick an application from an array of software with similar functionality. 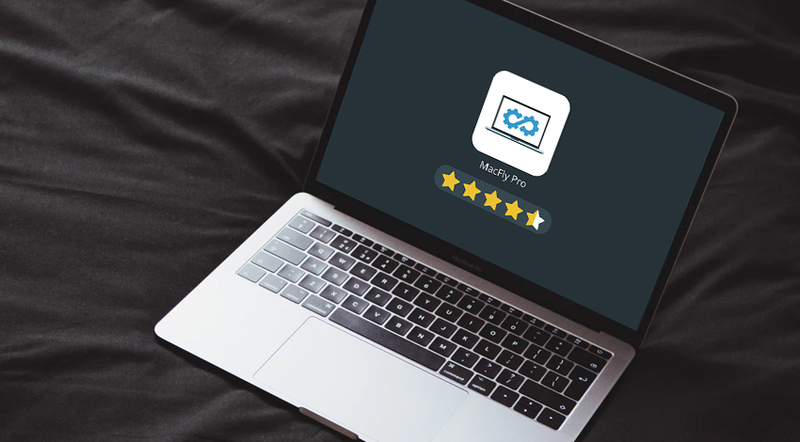 Presently, MacFly Pro is the app to challenge the key players of the Mac cleaning game, but is it worth installing on your Mac? So, how exactly is MacFly Pro different from other cleaning programs? Once the application launches, its main highlight, the Smart Assistant home screen, appears. Cast a glance at the user interface to learn about the available functionality represented by the tabs on top of the app window. One can see three tabs: Smart Assistant, Cleanup, and Tools. What’s cool about MacFly Pro, it doesn’t kick off with a scanning procedure right away. The user is free to choose when to start the system checkup by clicking the ‘Scan Now’ button when necessary. A user can stick around the Smart Assistant home screen to run a system scan, or decide upon the areas of interest and proceed to the other tabs. MacFly Pro’s Cleanup toolkit lives up to what you’d expect from the industry-leading utility apps. 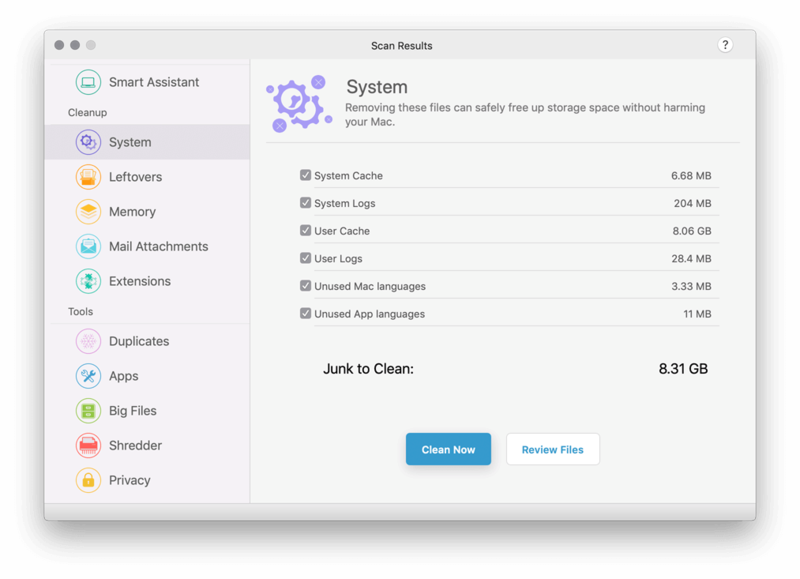 In the Cleanup screen, you’ll see System, Leftovers, Memory, Mail Attachments, and the recently-added Extensions feature. To get rid of the system junk, click on the Clean button under the System section. This option will help you reclaim the disk space by removing system caches, logs, and unneeded languages. The Leftovers functionality can check your Mac for the files remaining after the app uninstallation and delete them in one click. Mac’s memory gets clogged with idle processes so that the Memory section functionality can clean up the RAM in one go. As for the Mail Attachments block, it can help you locate the attachments saved in the home directory from the Apple Mail Client. And the recently-added Extensions, as you’ve probably guessed, allows you to take control over extensions installed on all of your browsers. Up next is the Tools tab with a selection of additional utilities meant for Mac’s disk cleaning and storage optimization. With its help, you can find file Duplicates, remove Apps, locate Big Files on your hard disk, erase sensitive user data with a Shredder, and clean up temporary files stored by your browser’s using Privacy. As in the Cleanup tab, the Tools tab has similar block structure with buttons for features execution. An intuitive user interface is one of MacFly Pro’s indisputable advantages. The app offers its users minimalistic design stripped down to essentials in order to maximize the functionality and emphasize the ease of use. Even beginners, who are only getting started with Mac, will be able to operate MacFly Pro with ease. All it takes is clicking the button located under each function block to launch a specific cleaning tool. MacFly Pro’s main attraction, the Smart Assistant tool, almost nullifies user’s involvement in Mac’s cleaning and maintenance procedures. The Smart Assistant does its job by stealth, so users won’t notice its activity until it alerts them to the necessity of cleaning. The periodic background checks run by the Smart Assistant do not impact the system performance in any way. Once the amount of system junk approaches the unacceptable limit, Smart Assistant reminds the user to clean out their Mac. Detected junk files can be removed with virtually a single click. Is MacFlyPro a Scam Application? 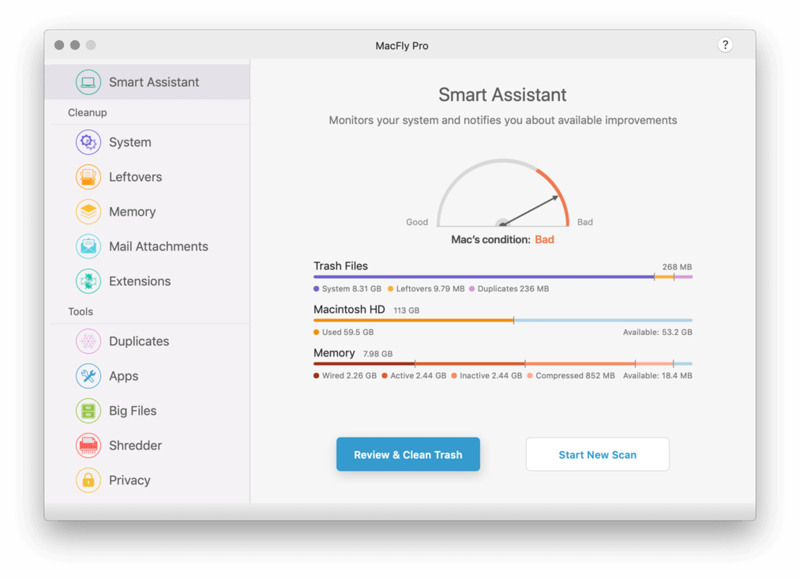 Is MacFly Pro a legitimate cleaning application? There’s no other way to find this out than by seeing it in action. When installing and reviewing MacFly Pro, the application looked nothing like other bloatware. No flashy banners, alerts, or “your Mac is in critical state” warnings appeared on the screen. The application located and cleaned out a bunch of junk files and trash quite fast. After the MacFly Pro activation keys have been distributed around the office, 8 out of 10 people who tested an app, said it was fast and efficient. Meanwhile, 7 out of 10 said they loved the app immediately and aren’t going to switch to other cleaners anytime soon. Most Mac users have positively acclaimed the application. MacFly Pro is praised for the intuitive user interface and ease of use. Owing to the Smart Assistant functionality, the user involvement is kept to the minimum. The cleaning process automation helps to avoid accidental data removal. Also, many users have noticed a significant performance boost in their Macs after the very first MacFly Pro cleanup. You can take it as the testimony to either MacFly Pro’s usefulness, or the condition of the average user’s Mac computer. To dispel your concerns, you can go ahead and give MacFly Pro a shot of your own. Although the application’s subscription model is a stumbling block for some users, it makes MacFly Pro available to various audiences. What is more, the loyal clients get special price offers. The application provides a 500MB cleaning trial, which is a great way to see how MacFly Pro operates. The trial allows removing most junk without being pressured on time. And if this isn’t enough of a test, you can subscribe for just one month, to conduct a more in-depth testing. If you like the outcome, all it takes is to extend the subscription. So, how much does it cost to use MacFly Pro? The price range depends on the subscription duration. The monthly subscription is $13,95/month, while the semiannual plan costs $9,82/month. Purchasing the annual plan, you will get a monthly price reduction to $7,82/month. As you can see, the subscription model tends to fit audiences with different budgets. The subscription-based model motivates software developers to work on the application improvements. Users advocating the one-time purchase system do not understand why they should be renewing their subscription to pay for the same thing every time. However, with every subscription renewal, users get visible improvements and see what they invest in. Several subscription plans provide a broad choice and allow reducing the expenses. MacFly Pro is a genuine Mac cleaner which delivers the essential cleaning and maintenance functionality. This application has no extra or unnecessary features included for the sake of overcharging Mac users! The Smart Assistant toolkit minimizes user involvement and makes all service and optimization procedures smooth and effortless. Such cleaning automation may repel the people wishing to have the complete control of cleaning procedures. Still, this will perfectly suit the Mac beginners or people transitioning from using Windows PC or Linux. 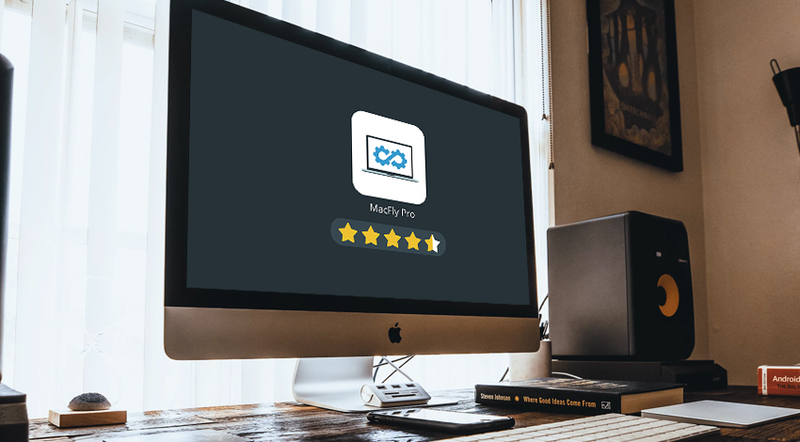 In general, MacFly Pro’s efficiency is on par with the expensive industry-leading cleaning software.